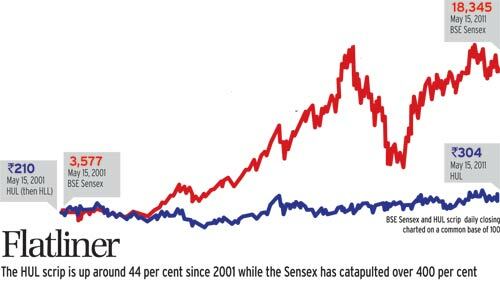 HUL had spent the last decade(2000-2010) struggling with incremental growth, and this was reflected in its stock price which had been mostly flatlining. While 2008 was a moderately good year, in 2009 the global slowdown and volative crude pricing put the company under pressure. Nitin Paranjpe, CEO Hindustan Unilever (HUL), reflects on the period with the observation that "This was a period when HUL lost out, as it was not leading the sector". A fixation with margins and price increases ahead of the market without any real innovation triggered a loss of market share, and as a result HUL also lost some bargaining power with retailers. In the category that they had dominated for many decades, they had lost leadership to nimbler competitors; while Godrej No. 1 became the top selling soap by volume in the northern states, Wipro's Santoor had taken the lead in the southern states. Clearly, there was a need to do things differently going forward. Having joined the company as a management trainee many years ago and risen to occupy the top job, Nitin Panajpe was in the best position to make an assessment of what needed to be done. It had become clear to him that the secrets to unlocking growth in the company lay with consumers and customers, rather than within the organization's meeting rooms. In the recent past, most of the creative intellect of the organization had inadvertently been used in endless meetings and reviews to explain away poor performance. Mr. Paranjpe was determined to change that. Along with his Management Committee, he decided to turn the company inside out with a singular objective - get into the customer's and consumer's mind and stimulate innovation across the organization. The dominant belief at the Management Committee was that a ‘Consumer and Customer First’ mindset within the organization was the single most important competitive advantage that they could create. There was also a belief that while this would be enabled by a holistic improvement of brand and service mixes to offer superior consumer and customer value, it could only be sustained by embedding a supporting mindset / culture which always puts the “Consumer and Customer First”. This was however easier stated than done. In order to demonstrate the organization's commitment to stay the course, every single person in the organization needed to be aligned to this mindset / culture with a clear understanding of the vision and objective. If every employee was to be instantly empowered to become more involved in providing better services and products to consumers and customers, it needed to start with a big bang! The leadership team was convinced that this shift had to be executed swiftly across the entire organization and they were going to lead from the front. 2. The organization will constantly monitor, improve and publicize brand and service mixes through the lens of best consumer and customer value. 3. Employees in the organization will seek to actively engage consumers and customers and always adopt the principle of “Consumer / Customer First” whilst taking decisions or prioritizing metrics. So, in 2010, Nitin Paranjpe and the entire Management Committee took the vital first step and launched Project Bushfire. There was no coincidence in the choice of the name. A cultural change of a magnitude never imagined before was to be realized, and a week was all that was available to ensure the fire caught! On the first day the entire management committee went out and met consumers and customers in villages across India. Over the next 5 days every HUL employee, factory accountant to a production engineer, treasury manager to human resource professional, every single person went out and met consumers and customers. What did I see that confirmed what I already know? What did I see that was in conflict with what I thought I know? What did I see that was totally unexpected or surprising? What should HUL start doing? What should HUL stop doing? What should HUL do more of? These were a set of simple open ended questions that gave people a large canvas to paint on, basis their experiences with consumers and customers. At the end of the day, a copy of the sheet remained with the manager while the other sheet was then collected and entered into a database. This was maintained by the Consumer and Market Insight Team. The database became a massive repository of the collective creativity of the entire organization. It could be queried for related observations and insights basis the problem that was being solved. That apart, the greatest value came from the responses to a specific question - "What should HUL start doing?". This question gave manufacturing managers an opportunity to throw their ideas on toothpaste packaging into the mix and personnel managers a chance to comment on stock policy. What it did, was to tell everyone loud and clear, that the consumer and customer was everyone's responsibility. Everyone's ideas were important, and the organization was keen to hear it, and more importantly, to act on it. 1. HEAR IT: In the build up the actual bushfire week, Nitin Paranjpe sent an impassioned mail to every employee, exhorting them to embrace this effort to reconnect with the consumer and customer. He asked for ideas from every manager, assuring them that every single idea that was received would be given a fair review. He assured anyone who contributed an idea, that they would hear back from him. There was an internal campaign in the office to poll people's understanding of what consumers and customers had to say about the organization. There were large banners hanging from the walls in the head office saying, "When was the last time you really listened to a consumer?" It was a clear call to action. 2. BELIEVE IT: With the stage having been set by their leaders, managers were then invited to log onto a portal and select a date and a town for their visit. Given the cultural differences across the country, a great deal of thought and rigor went into the selection of towns to ensure India was represented in its geographical entirety. At kiosks set up in all the offices across the country, managers were given their gear for the day - A pad to note their observations, a t-Shirt and a cap. With that, they were all set to go. 3. LIVE IT: On the appointed day, the manager arrived in the town, and was given her observation sheet and spent the rest of the day shadowing a frontline salesman from shop to shop. Or then, travelling from one consumer home to another. Most of the day was spent listening or asking questions to clarify. Not surprisingly, the most inquizitive were the set of managers who despite long careers in the organization were meeting consumers and customers for the first time! The day's work done, the manager returned to his or her day job a changed person. Somehow, the way they saw their job had undergone a subtle change - there was more meaning to what they were doing. A profit center accountant remarked, "The next time I push for a reduction the thickness of laminate of a tube, I will recall the rant of a wholesaler who showed me a case of leaking tubes in his shop". It was like, the whole picture became clear, suddenly! But that was just the first week in the start of a long journey. What Project Bushfire created, was a completely new mindset in the organization. In the words of Hemant Bakshi, Executive Director, Home and Personal care, "Our mindset in the past has been: 'why are you saying this about the product? You are not the consumer', but we can switch it around and say: 'You are a potential consumer and therefore your feedback is of value. In fact, you are an informed and expert consumer whose opinion is of greater value.'" By recognizing the might of employee feedback and encouraging everyone's participation in the innovation process (that had earlier been the domain of the 'brand developers' and 'intellectuals') HUL had opened the floodgates of every employee's imagination and generated a stream of ideas and potential innovations across functions. In the first round of Project Bushfire, many managers met and engaged with consumers and customers who actually stocked and used the products they were making in factories or developing in research laboratories for the first time! For many it was a cathartic experience, when some consumer articulated how the brand had made a 'real-difference' to her life. For others, there was some harsh feedback about the quality of packaging not being up to scratch. Most importantly, there was some new discovery for everyone who was a part of that experience. Subsequent rounds of Bushfire have focused on connecting with retailers and shoppers along with the re-launches of major brands like Fair and Lovely and Clear. Observations and ideas that were surfaced during these interactions were captured and then put into pilots for closer observation. Listed below are a few of the many innovations that have resulted from employee suggestions and ideas. Using Self-Help Groups to Make a Larger Impact on the livelihoods of people: HUL operates a large network of 'Shakti Ammas' (women in rural area who sell HUL products and supplement their monthly income) to reach their product to consumers in rural India. For many years, the focus had been on extending this network by relying entirely on products in the HUL portfolio. On a Bushfire visit an inquisitive manager asked, "Why can't the Shakti Amma sell non-competing categories that improve the lives of people?". That question led to whole new world of possibilities. Today, the Shakti Amma doubles up as a banking correspondent allowing her to help people in her village to open accounts. Elsewhere, Shakti members have become last mile payment collectors for cable operators or even caretakers for low-cost telecom towers. A partnership with a leading Telecom player has enabled her to sell SIM cards and recharge vouchers as well. All this adds to the importance of the Shakti Amma and adds to her income. Most significantly, the question that opened up this entirely different approach to the augmentation of Shakti income didn't come from a manager who had been working on the project! Better Fills at Retail Outlets: While speaking with a retailer, a supply chain manager was badgered about the poor fills that the retailer was being delivered. Later in the day, he was taken to distributor warehouse and shown a huge pile of non-moving inventory. It didn't make sense to him at all. Sitting in his office, the numbers had been improving steadily and he was on target to meet his objectives for the year. The two meetings served as a wake up call for him and he was determined to solve both these problems. After a week of thought and discussion with his colleagues, some of whom had similar experiences during Bushfire, he suggested a zero-inventory model. If the distributor only received stocks for confirmed orders he would have zero non-moving inventory. If the retailer could place orders based on stocks at a large mother depot, fills were bound to be better. Today, HUL has a system of zero-inventory - in this, products arrive at its distributors' place from an HUL depot and stay there for just one night before being shipped to the retailers. Non-moving inventory at these distributor points today is zero and retailers enjoy fills rates never dreamed of before. Use of Analytics in the Selling Process: On a Bushfire visit, an IT manager asked the question, "We have been saving all this retailer information over the last 2 years, Is there some way we can put it to use to improve the sales call process". It hadn't occurred to anyone in the sales system that this volume of sales data at an outlet and SKU level might be a source of competitive advantage for a salesman making a call. This query resulted in Project IQ that uses technology and sophisticated analytics to find out the buying pattern of customers [here, customers are retail outlets] throughout the chain. Every single urban outlet, what was bought, at what frequency etc. This information is then pushed to the tablet that the salesman uses to make the sales call. Today, when a salesman stands before a customer to make a sales call he has all the information to convert the sale at the click of a button. He can even tell a retailer how much stock he has of a particular SKU with a 95% accuracy without even looking at the shelves! The productive use of this data has gone a long way in assuring retailers that HUL is on top of its portfolio enabling more effective placement of new launches. Bringing New Outlets Under Coverage: A particular manager at a factory site in Mangalore, a coastal town in India, had for many years been perplexed that HUL products weren't available at his neighborhood store. He had written a few emails to the sales manager but nothing had moved. Frustrated by the experience he had given up any hope of the outlet ever being covered. During Bushfire a number of managers reported similar experiences. When all the observations were looked at in totality, there was clearly a case to build a new means to add retail outlets to coverage. Not surprisingly the idea for a solution was also in the observation sheets that were collected. This manager while moving from one outlet to another, found an outlet that wasn't serviced by a company salesman en route. He asked the retailer if he would buy if a salesman were to call on him every week and he answered in the affirmative. The manager worked in the IT department and suggested a module to automate the process. What resulted was POPEye (Point Of Purchase Eye), a project that allows any uncovered retail outlet to call a number and be serviced by HUL within 3 working days. At last count, over 5000 outlets had been added to the organization's direct coverage through this route. Communication of a Trade Helpline Number: While meeting with a shopkeeper, a factory manager was perplexed that he wasn't aware of the existence of a help line to report packaging or manufacturing issues. The help line had been in existence for over 3 years but this information wasn't available to the people who needed it. The factory manager had observed that many intermediaries down the supply chain were using the boxes used to transport products. He suggested that the help line number be printed in large font on all primary and secondary packaging material in order for it to be communicated down the line. This idea resulted in a dramatic increase in the number of calls that the trade helpline received. Changing case configurations of a Hygroscopic Product: Sonika Malhotra, a participant in the Bushfire project narrates a story about her supply chain partner insisting that the team review and reduce the case configuration for one of our sachets. This was motivated by his Bushfire visit, when he had observed that retailers in the hills were hesitant to take the current large cases in the monsoon season in India. (The sachet in question is hygroscopic and the monsoon season worsens the problem). In her words, "The beauty of the Bushfire program is that it brings a holistic thinking to our innovation process and encompasses every element of the brand plan." While these are just a few of the many ideas that came from across functions, the most dramatic change came in the manner in which people started to collaborate across functions. A couple of years ago, a brand manager wouldn't be caught dead asking his finance counterpart for an opinion on a piece of advertising. Today, it is common. One of the often narrated stories is about a piece of communication that was erroneously translated by the advertising agency while rendering it in a local language. While the brand manager didn't understand Tamil, his supply planner did. So while the supply planner was giving the brand manager his views on the commercial, he also mentioned that the word used could be derogatory in some contexts. This allowed the brand manager to make a correction before it went on air. As these stories began to spread like wildfire across the organization, aided by the publication of a cover story in the in-house magazine 'Hamara', managers became increasingly comfortable admitting they didn't have all the answers. Previously, admitting that you had hit a dead end was frowned on. Now, it was becoming increasingly common for a project lead to throw his hands up and say, "I'm not sure, do you guys have any ideas?". And expect his colleagues from entirely different functions to throw their suggestions in. To begin with there was a lot of skepticism around this being another 'flavor of the season' activity. There also was a reluctance to give up a full working day to invest meeting consumers and customers initially. Many managers discussed the futility of expecting non-sales and marketing people to ever make a meaningfl contribution to consumers and customers - what value might a supply chain person add to the organization by meeting consumers? The ingrained assumption was that consumer and shopper understanding was the responsibility of the sales and marketing function. When an IT system was put in place to schedule the Bushfire days for 4000+ managers, there was muted enthusiasm over the first few days. Attempts to get managers to give suggestions and ideas in the past had been met with very poor response rates, and even those who responded seldom got any kind of follow up action. A large number of managers wrote to the Project Manager of Bushfire outlining reasons why they wanted to be excused from participating in this initiative. In the words of one such manager seeking to be excused, "My job is to maximize the production in my factory everyday. I am convinced that my absence from the factory for an entire day will result in a greater loss for the organization than any observation or insight I might have from meeting consumers and customers, who meet our sales and brand managers quite regularly". Under instructions from the leadership, no exceptions were to be made. There were options in terms of dates, and everyone was to spend this day as prescribed. With two days left to close the scheduling process, outbound calls were made to managers who hadn't logged onto the system and slots were assigned to them. It was imperative that we reached 100% schedulling before the launch day. The Management Committee was keen to lead from the front and every single one of them signed up for the first day. The first day was covered by a large number of camera crews, and the number of suggestions that were coming in from managers was also being reported on a daily news letter that went out to everyone in the organization. Early innovations from people in supply chain and IT, who brought a kind of out-of-the-box mindset to problems that had beset people in sales for many years spread like wildfire, and very soon the organization was buzzing with stories about how someone from Research came up with a slight tweak to a selling algorithm on a Hand Held Terminal to make the accuracy of sales forecasting sharper etc. The Project team did a fantastic job of spinning all these anecdotes into compelling stories and very soon the mood tipped. By the third day everyone who hadn't completed their day in the market couldn't wait for their chance to get involved. Most importantly, everyone who made suggestions in their observation sheets got a mail acknowledging them for their contribution and promising a follow up mail on how their idea was being taken forward. When people began to share these emails with one another, there was a rapid build up of belief and trust in the whole exercise. People began to believe this was truly different from the flash in the pan kind of activities they had been a part of in the past. In order to track the effectiveness of the cultural and mindset shift that Bushfire sought to engender in the organization specific metrics were identified for consumers and customers. In a two year period all of these scores had moved substantially and continue to improve as the organization puts more and more of the ideas into play in an increasingly competitive FMCG market. From an external perspective, HUL, soared to its life-time on Thursday, September 13th 2012. The stock had been gaining steadily in the past as an increasing number of investors are betting on the company's renewed focus on innovation - product, sales and distribution supply chain. The shares had gained more than 34% in the current calendar year, which is double that of Sensex, which gained 17% in CY12. An analyst report said; "While HUL was always looked upon as a defensive bet, the recent past has seen a change in the investor mindset as the company got aggressive in areas like product innovation and distribution that play an important role in the FMCG sector. HUL has seen a significant rise in innovations in past three years, which has been one of the key drivers for the company to maintain strong volume growth in FY11 and FY12,” said the report. The pace of innovation has seen a rise with over 60% of HUL’s portfolio being touched by innovation in FY12 itself, it added. The company has been trying to extend most of its key brands into newer categories such as hand and facewash, liquid detergent and premium skin lightening. HUL's personal care portfolio that contributes 30% to its R22,000-crore sales and over half its operating profit, also enjoys a higher margin. People across the organization now recognize how critical it is to have the pulse of the consumer and customer at all times to fuel the innovation funnel. After Bushfire, other metrics have evolved liked the Consumer and Customer License. A manager earns a Consumer & Customer License after he or she has spent 50 hours working closely with them. Every year a manager must renew his license, and this serves as a reminder that the consumer and customer needs are constantly changing, making the need for innovation a constant one. Other benefits that have accrued can be best described through the actions that senior managers have taken after having been a part of this program. 6. When new members join the team, some team leaders ensure they spend ONE WEEK/50 hours to visit consumer and customer. While one can't put a number to the exact number of innovations that have been triggered by this large scale connect with consumers and customers, it is safe to assume that the contribution is significant. Recognizing this urgency around innovation coursing through the veins of the organization, in 2011, Hindustan Unilever Limited, was ranked sixth in the list of ‘The World’s Most Innovative Companies” published by Forbes in its 22-07-2012 issue. HUL was the top ranking FMCG company and the top ranked company from India in the list. In 2012, Hindustan Unilever was featured in Forbes list of ‘The World’s Most Innovative Companies” for the second consecutive year. With a ranking 12, HUL was the second highest ranked Indian company and also happens to be the highest ranked FMCG company worldwide. Chanakya Gupta, a manager in the Modern Trade Team captures some of the intangibles that go with Bushfire when he says, "We, in the Modern Trade team, took a leaf out of this initiative and conceptualized an initiative called 'Blitzkrieg', where it was about selling our products personally to the the shoppers, who are proxy for consumers for us in sales teams. This initiative was taken during the launch of Pepsodent Expert range, where more than 200 managers in the organization, spent a day on the retail shop floor and sold Pepsodent Expert range to the shoppers - convincing them that the product was better than any other product available to them. Along with it, they handed out business card so that they could call in and give us their 'good / bad / ugly' feedback on the product. This rich interaction with the shopper at the moment of truth gave us real-time understanding of what she was looking for in her toothpaste. It also made me realize how tough the life of a product consultant on the shop floor is and how we were not doing anything to make her work life simpler and better." He also recalls a day in the market with Mr. Nitin Paranjpe, when they were trying to sell Kissan Soya juice to a shopper, convincing her that the product was the healthiest amongst all the competition offering. The shopper stumped both of Chanakya and Mr. Paranjpe with a short and 'sweet' response - "I know it has soya and soya is very healthy, but how could the juice be healthy if it has sugar in it?" And the it struck him that no one in the organization ever thought of it or picked it up during the rigorous consumer testing they do before any launch! That according to him, was the power of real insight and a window to innovate, that HUL was getting access to through this initiative. But the greatest benefit is the cultural shift that has allowed a degree of collaboration and partnership, never witnessed before in the organization. The functional silos that organization historically operated in have given way to a melting pot of ideas and creativity where everyone's views are sought and valued, no matter which function you are from. A staggering increase in the number of ideas that go into the innovation funnel is just one of the most obvious benefits of this cultural shift. 1. Communication. Communication. Communication: A big reason for the success was the constant communication. Be it the creative in the Hear It and Believe It phases, or the newsletters and suggestions scorecard in the Live It phase, constant communication kept the fire burning. 2. Make It Simple: For a lot of people in the organization this was going to be a new experience, so it had to be as simple as possible. By e-enabling the process and ensuring everyone had discussion guides and FAQs to refer to, there were a few hitches even thought 4000+ people were in the field during those 6 days. 3. Make Follow Through Visible: Trust and Commitment tipped when people saw a visible committment to follow through on the ideas that they were throwing into the mix. People were given credit publicly when one of their ideas was chosen to put into a pilot. They were involved in the pilot process. A manager on the Management Committee acknowledged every single idea personally. A scorecard kept track of the total number of ideas coming in and everyone could see it. 4. Be Patient: It takes time for a culture change to catch on. The initial response was very poor, and a large number of people had to be prodded to sign up for the project. By staying the course and not taking the foot off the accelerator the organization was able to get to that critical point where it tipped and was then self-sustaining. 5. Lead from the Top: The leadership role-modeling beginning with Nitin Paranjpe and his Management Committee went a long way in demonstrating to the entire organization that they were serious about needing to make this shift. By walking the talk, sharing their observation sheets and their own personal stories, they struck a chord with a large number of managers early in the program and gave it the impetus it needed at the start. 1. Every employee in the organization has a bright idea they desperately want to share with the larger organization. They just aren't sure that they have the permission to do so: Innovation can come from anyone in the organization. You would be making a huge mistake by assuming that a Ph.D. in Organic Chemistry has no value to add to the selling process wired into a tablet PC. Today's problems require innovations of a different kind altogether and richness of perspective adds significantly to the process. By focusing the intellect of managers from diverse functions on consumers and retailers, HUL has been able to remain at the cutting edge of innovation in the FMCG business. 2. Problems that haven't been solved by functional specialists are more likely to be solved by a cross functional team: Problems that haven't been solved by domain specialists often get cracked open when they are attacked by a set of 'Fresh Eyes'. What these 'Fresh Eyes' achieve is almost akin a childlike curiosity where there is no question that is 'Too dumb to ask'. These questions often help to reframe the problem for the specialists and they can take over from there. A multi-disciplinary approach is being preferred with increasing frequency when it comes to making big innovations happens. 3. Find a Freaky Friend Faraway: I'm stealing with pride from Tom Peters here but there is a lot of sense in what he says. For a large number of managers, the customer or consumer they met was indeed that freaky friend in a faraway place who changed the way they saw things. By allowing employees from all disciplines to come in direct contact with consumers who buy HUL's products and retailers who stock and sell HUL's products, a large number of manager's eyes were opened to the reality of the real market place. A packaging manager who had see every format of packaging in the shampoo industry from across the world, got an amazing idea when he saw how tetra-packs had been reengineered to allow them to be suspended from a rod to improve visibility. 4. Stories trump Corporate mailers or announcements every single time: When you are looking to change culture and mindsets, stories work like nothing else. People trust stories and the people more than they do an anonymous corporate profile that shows up in their inbox as a VERY IMPORTANT message from "Communication, Corporate". Once stories started spreading, culture began to change. It became safe to suggest ideas without judging them in your mind before hand. But it was the stories that assured people it was safe. 5. Get clear about where you want all your innovation effort to be focused: By putting people from every corner of the organization in direct contact with the consumers and customers (ultimately, they're the people that truly matter) HUL is maximizing the possibility of getting new ideas in these specific areas. Importantly, they are calling these two out as the source of competitive advantage. Innovation effort across too large a canvas can lead to you getting lost. Striking the right balance and focusing the effort brings in the best returns on the effort being put in. 6. Innovation doesn't mean BIG Innovation all the time. A number of small innovations can make a BIG difference: The dominant notion of innovation is that it happens on big budgets, big projects, big problems. Nothing could be further from the truth! A large number of small innovations in different parts of the organization can provide significant competitive advantage in the long term. This needs to be communicated to everyone across the organization. A large number of managers don't share their ideas because they think their innovation is 'too small'. As Marcel Proust observed, “The real voyage of discovery consists not in seeking new landscapes, but in having new eyes.” Bushfire bestowed "new eyes" on a large number of managers from truly diverse functions and unlocked a whole new mindset and culture of innovation across the organization. It's so satisfying to see Project Bushfire blazing in all it's glory across the Unilever world. This is one project we started in Dubai which spread virtually like fire across regions in no time. It makes me even more happier to have lead and named the project "Bushfire", for which, Sanjiv Mehta, Chairman Unilever North Africa & Middle East (NAME) conferred a special award during a gala function in Dubai, following the nomination of the project for Paul Polman's awards night in London, where we came second best. Bushfire is still blazing across our region in NAME and is perfecting many more stores on our path to creating More Stores, Better & Better served stores, particularly in General Trade. Felt great to read all the stories and testimonies. Thanks Steve for putting the entire jigsaw together. When I got the invitation mail to register for Bushfire (Fair & Lovely) and discussed with my colleagues , I had received similar cynical responses - 'What good can come out of this! ', 'I have too much on my plate here, why should I waste time meeting the customers and consumers! ', 'If we just give the money, we are spending on the flight tickets to travel for this initiative, to the field force as incentive, we'll probably get better execution!' and sorts. But when I went out and spent that day with the merchandiser in the outlet, I realized that getting execution picture perfect on one single day across is the country is just one of the many objectives of this mission. The real gains came out from connecting with the shopkeeper, the consumer and the field sales and merchandising team, who gave real time feedback not only on the product but also on what's happening in the market place and how their decision making and purchase behavior is changing. This initiative brought about 2 major changes in the organization - a) there were no 'customer and consumer' champions or gatekeepers in any meeting - everyone sitting in the room was responsible for asking the million dollar question - 'Is it right for the consumer?' b) people who had spent some time in the field meeting customers and consumers in their initial years of work, got hit by the stark reality that they could no longer rely on their yesteryears' learnings - the world had indeed changed around them! We, in the Modern Trade team, took a leaf out of this initiative and conceptualized an initiative called 'Blitzkrieg', where it was about selling our products personally to the the shoppers, who are proxy for consumers for us in sales teams. This initiative was taken during the launch of Pepsodent Expert range, where more than 200 managers in the organization, spent a day on the retail shop floor and sold Pepsodent Expert range to the shoppers - convincing them on how the product was better than any other product available to them. Along with it, we gave our business card so that they can call in and give us their 'good bad ugly' feedback on the product. This rich interaction with the shopper at the moment of truth gave us real-time understanding of what she was looking for in her toothpaste and what will make her get those green bills out of her wallet. This initiative, of course, also ensured that the whole back end and front end of launch plan was picture perfect. It also made me realize how tough the life of a product consultant on the shop floor is and how we were not doing anything to make her work life simpler and better. I remember during one of the market visits with Mr. Nitin Paranjpe, when we were trying to sell our Kissan Soya juice to a shopper, convincing her that the product was the healthiest amongst all the competition offering and she stumped both of us with a short and 'sweet' response - "I know it has soya and soya is very healthy, but how could the juice be healthy if it has sugar in it?" !!! And I was thinking, why no one in my organization ever thought of it or picked it up during the rigorous consumer testing we do before any launch!! And that is the power of real insights which HUL is unleashing through this initiative! When one reads an article that reminds you where it started you realise that 'consumer and customer centricity' as a phrase or a way of behaviour is 3 years old in the HUL system, because its been rooted so strongly now that it feels like the organisation has been saying it and living it for much much longer than that. To be honest I approached Project Bushfire with slight cynicism at the beginning, thinking, whats so new, I go to the market every 2 weeks, I see outlets, meet traders, check stocks, so whats new here...its only once I returned from the initiative that I realised what a huge difference it had made to the way we think as a team, as a group and as individuals. The beauty of an initiative hinged on a principle as strong as it is, brings a holistic thinking for our innovations and for every element of the brand plan. I distinctly remember in one of the network meetings my supply chain partner insisted that we should review and reduce furthermore the case configuration for one of our sachets because at his Bushfire visit he discovered that in small towns this certain sachet needed to go to small outlets in the hills that were hesitant to take the current cases since the product is hygroscopic especially during the rains. As much as On time in full was his target as well, we decided to take the feedback on even if it put the network on a rush. An initiative like Bushfire ensures that when we sit as a team, we think for the consumer & customer and not for the function we come from- whether its marketing, packaging, formulations or finance. I am also very happy and actually proud that Unilever has taken the steps it has to make real entrepreneurs out of our Shakti ammas. Using biometric identification to open an account at high speed or becoming cable payment collectors sound like excellent leveraging of technology and true signals of us taking development at the very grass roots. Thanks for your contribution Sonika. You make a very valuable point about the initial cynicism that almost all "initiatives" are met with! The story you tell about a realization that a supply chain partner had during bushfire and the consequent action he took is a great one and I will be sure to build it into my final draft! I distinctly remember Project Bushfire as part of the marketing team in the JV of Kimberly Clark-HUL. The factory was a separate unit in Pune,and the people working in the factory were far removed from the sales function of HUL. Consumer and customer feedback that reached factory through multiple layers often resulted in defensive posturing. Bushfire helped bridge this gap and soon the people working at the factory were back from the market buzzing with ideas and solutions to various issues that had come up.They went from simply being answerable to quality complaints to becoming active partners in proactively making systemic improvements that could further improve stock availability and quality of product and packaging. Sandeep: You make a very interesting point about the shift you observed - From "Being answerable for quality complaints" to "Being active partners in making systemic improvements". The latter is far more likely to drive innovation than the former! In one the chairman's reviews, our CEO Nitin Paranjpe had said "The job description for any job in organisation must be that its a growth enabler for the company". It is precisely this attitude that has translated into initiatives like Bushfire, which touch every single employee in the organisation regardless of function, in turn leading to ideas and innovation. As part of the IT team, I have worked closely with the Customer Development team over the past many years, and it has been an absolute delight co-creating leading edge solutions that will give HUL the competitive edge in the long run. Consumer and customer centricity being driven across functions has really helped the organization become more innovative, and has helped it in the marketplace. The big transformation has come from departments like R&D and Supply chain, where people have started thinking very differently, compared to my early years here. Having been an ASCM, there is no doubt that there is always something to be learned when we spend time with the consumers and customers. While the field teams do this regularly as part of their job, events like Bushfire allow every person in the system to go out there and share their experience from these visits. The PopEye bit that has become part of the system for over a year now is a great initiative as it allows every employee to have a say in terms of how the outlet looks and thus helps ensure that we are able to satisfy consumer needs. While iQ has ensured that we take the right products to the right outlets, the PopEye project helps sharpen this even further. As a Sales Manager I had the privilege & took part of both the Bushfire activity – Fair & Lovely & Clear. Chennai town used to see huge fanfare during the Superstar Rajnikanth movie releases. When we executed the activities in 2010 & 2011 entire market place got into the same electrifying scene. Every visitor to the market along with the Salesman will ensure all the DSM materials will be put in place properly & many times they themselves will do this. This will get them close to the retail owners and in most of the cases; the owners started helping the visitors to put up the POP materials in a right way. This brings more closeness between the company people with the trade instantly. The same way “PopEye” really helped the sales team to identify the non availability of the products in specific stores through our own company people. This particular products will get added in to the salesmen’s must sell in his subsequent visits to the stores. This really helps the sales team to place the right products in the stores as well for the shoppers to get their required brands. Every HUL employee can add value to the company through this Popeye initiative, which matters more to us now.